Synopsis: Lucy and Owen meet somewhere between the tenth and eleventh floors of a New York City apartment building, on an elevator rendered useless by a citywide blackout. After they’re rescued, they spend a single night together, wandering the darkened streets and marveling at the rare appearance of stars above Manhattan. But once the power is restored, so is reality. Lucy soon moves to Edinburgh with her parents, while Owen heads out west with his father. My review: This was such a fantastic read! I blew through more than half the book in one day because I simply could not put it down! Our two main characters, Lucy and Owen, take us on a journey of love and travel that makes you feel like you’re being transported to all the different places their going, and you develop this deep and unique connection with each of them. I simply loved how the viewpoints switch back and forth between the characters because you could get both sides of their stories and see what each one was thinking. In the end this was even better because you became excited when things began to line up for each other and they told the opposite character what they were thinking the whole time. There is something about Jennifer E. Smith’s writing that is so flawless and easy going, that while you’re reading you don’t even notice you’ve gone through 100+ pages until you reach the end of the book. The ending left me completely satisfied and this being the first Jennifer E. Smith book I’ve ever read I can’t wait to pick up her other one’s. 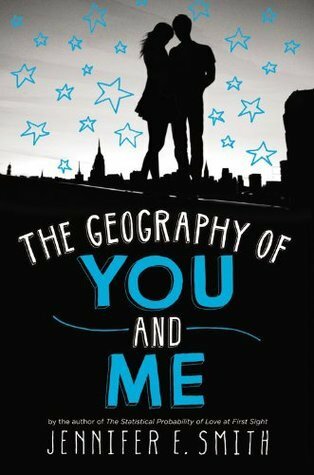 I hope they are as fantastic as The Geography of You and Me was! Make sure to pick this up when it comes out later in April! Also, this cover is simply gorgeous! I love a dual POV done right and I know Jennifer E. Smith is an amazing contemporary writer!! Her Statistical Probability of Love at First Sight made me swoon and wish I were on a plane with a cute British boy ;D Definitely going to read this one, so excited!! I've been wanting to pick up these books, before the first one even came out! But still haven't found the chance to. I'll have to pick them all up and marathon them! Glad to see you enjoyed this one!